The latest collection from Reiss is sleek and chic with some pretty inspiring monochrome prints. I also picked up a copy of their magazine, the Reiss Journal No. 3: ‘The Hot Issue’. It showcases the latest fashion direction the brand has taken for the coming spring/summer; pretty pastel dip-dye, lots of leather separates, fine knits and prim pleats. As well as these beautiful shots that illustrate Reiss’ new season prints. Reiss has also gone for a L.A.- style summer, taking inspiration from ‘laid back West Coast Style’, think David Hockney, palm trees, Venice Beach and Paradise Cove. Designs could almost be inspired by music like The Byrds, The Beach Boys and the Red Hot Chilli Peppers. This is new… mint-green city shorts, a navy-blue sweater and a black leather jacket with rolled-up sleeves – I’m in. Summer is nearly here and I’m happy to be inspired like this. Sometimes you’ve just got to get in the festive spirit. This time last year we were knee-deep in snow and even Dublin airport was struggling with the Christmassy weather. This year however, Dublin is looking positively un-Christmasssy, I reckon people aren’t even putting up Christmas decorations at home either. Having tried and failed to get the apartment to look remotely festive (a bit of manky old tinsel over the TV does not a festive sitting room make), I’ve suggested that we go to Kildare Village instead. I went there last year (by train) and the decorations were so pretty, you feel Christmassy as soon as you’re in there. A couple of glasses of wine at L’officina may have helped in that respect. There aren’t many High Street shops that I wish I could afford to spend more money in; however one of them is Jack Wills. Luckily, their outlet shop Kildare Village is one that I can afford to spend more money in. I went a little crazy when I first discovered it and its cheap-as prices. E.g. 60% off women’s shirts. 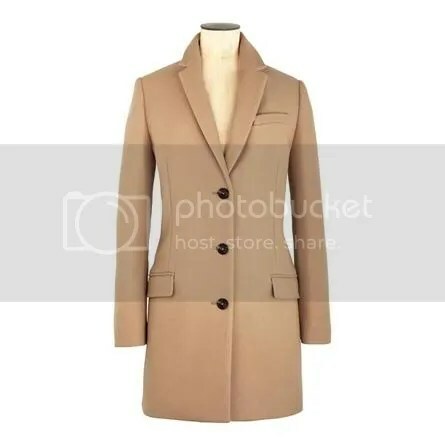 I’m sure it’s wishful thinking, but I really want this Crombie-style ‘Marbury’ jacket. If they don’t have it in the Kildare Village outlet store… Santa, I really hope you’re reading this. 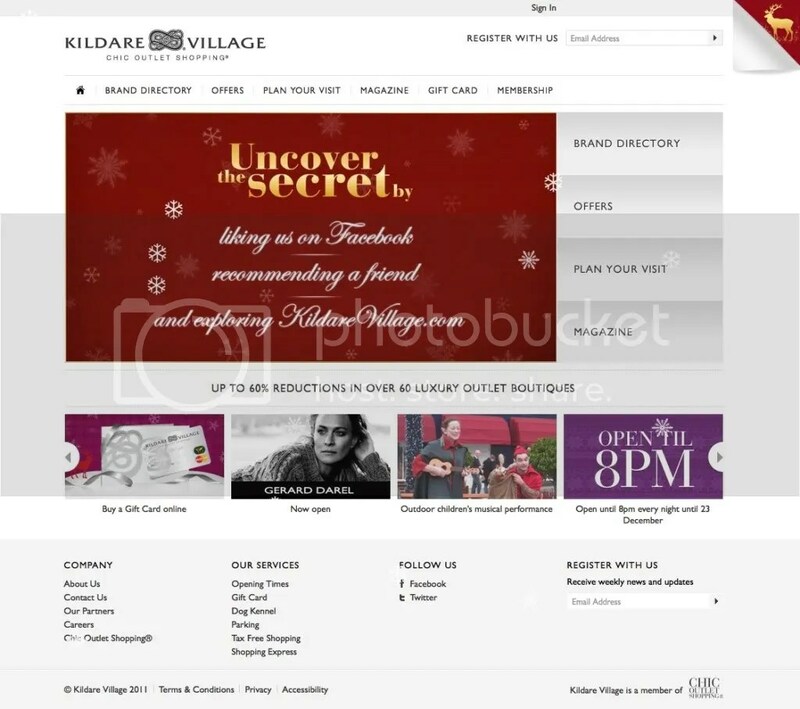 Incidentally, I just ‘liked’ Kildare Village on Facebook and entered their Festive Secrets Christmas competition (it closes Friday, 23rd). I’m holding out for the unlimited free pass to OPW tourist attractions. May as well give it a go, right? Time to open up the first door of your advent calendar! To celebrate December 1st and the date when it’s OK to feel festive and Christmassy, we’ve gone all dreamy with the ballet inspired Christmas windows in Brown Thomas, Dublin. The only Christmas windows worth looking at in Dublin in my humble opinion. (See 2009 and 2010 here). Last week Public Beware opened a new boutique in Dublin. The venue, spread over two floors, is a great space; all exposed brick and beams with simple lighting and storage fittings. Public Beware is a British fashion label, which began in London’s East End in 2002; the Temple Bar store is its first overseas venture. Edgy, Urban and laid-back the collection features a mix of printed pieces, and classic pieces with a twist. Coast had their preview in Dublin today. I rarely have occasion to dress in something so classic, and in reality, my style is a little more dishevelled to do pretty prom dresses and gowns justice. But this Merlot, backless maxi-dress was too perfect to not try on. I was at the Oasis A/W11 preview yesterday in Dublin. 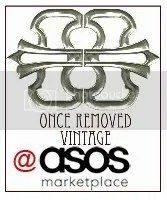 Oasis have joined the majority of the High Street in creating a hugely vintage-inspired collection for this Autumn / Winter. Think 70’s sheer and metallic fabrics, midi-length dresses and knee-high boots, all in ox-blood, cerulean and mustard shades. Think 60’s textures and prints; like Hounds-tooth and leather accents in monochrome and red. With the appointment of a new buyer, the focus yesterday was very much about the accessories. I saw boots, biker, riding, ankle and knee-high; ballet flats in animal prints; delicious high-heeled loafers and beautifully made, classic leather handbags with pony-skin details.